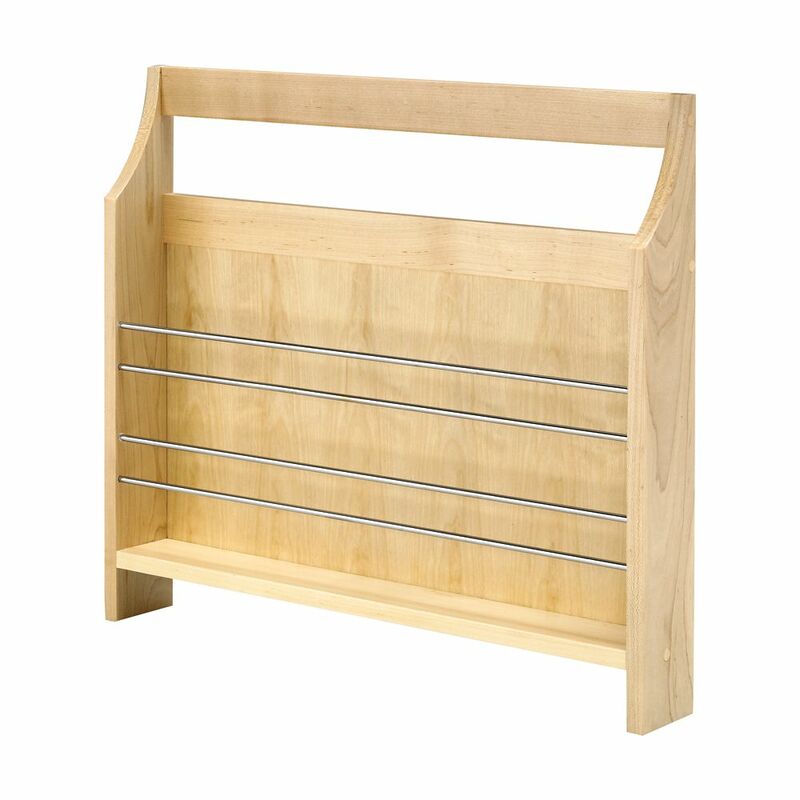 The wood FindIT Base Cabinet Pullout Side Caddy is the perfect solution for wider cabinet spaces. Side mounting to your wood Base Cabinet Pullout , the Side Caddy will fit in an 18 in. standard base cabinet or a 14 in. wide opening. After installation, the wood Side Caddy can be easily removed and replaced - the perfect portable solution. The wood Side Caddy is a solution for rolls, cookie sheets, muffin tins and a variety of other hard to store home necessities. The Side Caddy could also be mounted on any flat surface for additional organizational solutions. We were thinking of you when we designed this program. FindIT Wood Side Caddy - 19.125 Inches x 3 Inches x 22.125 Inches The wood FindIT Base Cabinet Pullout Side Caddy is the perfect solution for wider cabinet spaces. Side mounting to your wood Base Cabinet Pullout , the Side Caddy will fit in an 18 in. standard base cabinet or a 14 in. wide opening. After installation, the wood Side Caddy can be easily removed and replaced - the perfect portable solution. The wood Side Caddy is a solution for rolls, cookie sheets, muffin tins and a variety of other hard to store home necessities. The Side Caddy could also be mounted on any flat surface for additional organizational solutions. FindIT Wood Side Caddy - 19.125 Inches x 3 Inches x 22.125 Inches is rated 4.5 out of 5 by 2. Rated 4 out of 5 by Horatio from Nice accessory I bought this as an accessory to a kitchen storage roll out. It came fully assembled with clear instructions for mounting it on the roll out. Rated 5 out of 5 by rgsanchez12 from Great addition to my new base pullout! I just purchased a new wood base pullout for my kitchen, but I had some extra space left on the side once it was installed. The side caddy was a perfect solution. It was quick and easy to install, and now I have a place to store baking sheets and cutting boards. Excellent purchase!